Travelers depart the U.S. for Frankfurt, Germany via overnight air service. After a morning arrival at the Frankfurt Rhein-Main International Airport, check in at the Frankfurt Sheraton Hotel and Towers*, where dayrooms have been reserved for your comfort and daytime relaxation between flights. This evening, depart refreshed and rested for Cape Town, South Africa, aboard scheduled, overnight air service. *Note: Day rooms are only available to Air Program travlers. Some Air Program travelers may be routed through Munich. In that case, dayrooms will be provided at the Munich Airport Kempinski Hotel. Arrive at the Cape Town airport, and transfer to the exquisite Mount Nelson Hotel, a historic city landmark. The balance of the day will be at leisure to relax and explore the hotel facilities. 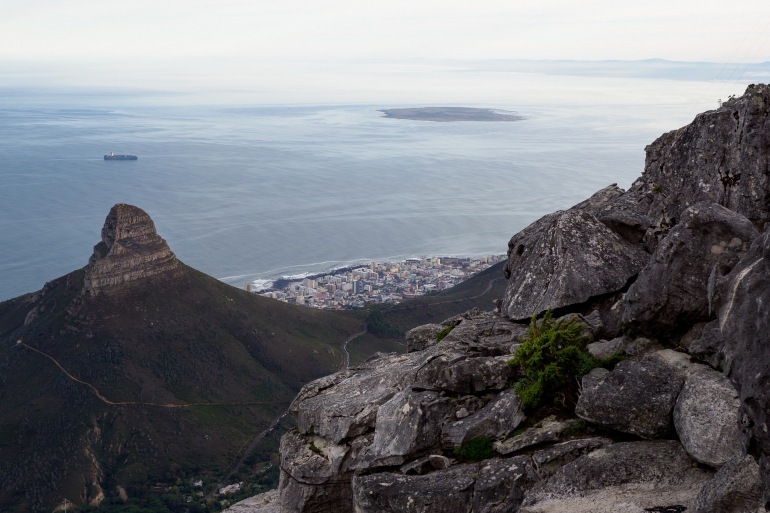 Begin the exploration of Cape Town with a tour of the city’s highlights and an ascent of Table Mountain (weather permitting) for breathtaking panoramic views of the city, Table Bay and the Cape of Good Hope. Continue on to Robben Island. For nearly 400 years, isolated Robben Island was a place of exile. Cruise to the island by boat and tour the former prison where the late Nelson Mandela was incarcerated from 1964-1982. The tour is performed by a former prisoner with first hand knowledge of life on the island. Then, see the island’s lime quarry and local village. A lecture on The History and Culture of South Africa will highlight some of the key events in the history of this amazing country, including Dutch and British colonization, the introduction of slavery, struggle of native tribes, discovery of gold and diamonds, and more. Motor this morning to the Cape Point Nature Reserve. Journey along the magnificent Marine Drive, beyond Lion’s Head Mountain and past the Twelve Apostles, limestone stacks that rise from the sea. Continue to picturesque Hout Bay, a coastal suburb of Cape Town. Ascend Cape Point by funicular and marvel at panoramic ocean views. Visit Boulders Beach and see the African Penguin Colony. The 900-mile rail adventure aboard Rovos Rail begins this morning with transfer to the train station where you board a luxury train born in a bygone era. Experience the elegance and excitement of traveling by rail, while marveling at the spectacular South African veldt. Journey to the charming, perfectly preserved Victorian village of Matjiesfontein, an oasis situated in the semi-desert region of Klein Karoo or Little Karoo. Declared a National Historic Monument in 1970, Matjiesfontein is home to the Victorian Matjiesfontein Railway Station. In addition to being a stop on the Rovos Rail line, this historic building is home to the Transnet Museum. Its treasured exhibits include a stationmaster’s office from the late 1800s, the original signal room and signal box. Another highlight of the Railway Station is the Marie Rawdon Museum, which showcases an eclectic collection of Victoriana and Boer War memorabilia. Breakfast is served on the train. Gather with fellow travelers in the observation lounge and revel in the breathtaking landscape of South Africa. Enjoy the distinctive character and charm of Rovos Rail’s classic, refurbished wood-paneled coaches. After an overview of the world-renowned diamond city of Kimberley, visit the Diamond Mine Museum and the Big Hole, one of the largest man-made excavations in the world. Enjoy breakfast aboard, and then relax with leisure time before arriving in Pretoria. Disembark the train and motor to the area of Kruger National Park and the deluxe Thornybush Game Reserve. Get an early start this morning with a game drive to find and track South African big game. After this exciting outing, luncheon will be served at the lodge. In late afternoon, another game drive is planned. As the sun sets, join fellow travelers for “Sundowners”. Dinner this evening is a “Boma” traditional dinner. Start the day just after sunrise, for another chance today to track the Big Five African wildlife with a morning game drive. After a hearty lunch, there is time to relax. Drive from Thornybush Game Reserve to Hoedspruit for the flight to Johannesburg. After a late morning arrival in Johannesburg, enjoy lunch followed by an afternoon tour of Soweto Township. The tour will drive past the homes of Nelson Mandela, Winnie Mandela and Desmond Tutu. Afterwards, drive to Kliptown, for a tour of a local youth project and tree planting ceremony. Overnight at the 54 on Bath Hotel. Transfer to the Johannesburg International Airport for the flight to Victoria Falls. Motor to the Victoria Falls Hotel. Victoria Falls is located on the border of Zambia and Zimbabwe where the Zambezi River plunges over 300 feet into the basalt gorges and mist below. An afternoon excursion visits the falls, one of the seven natural wonders of the world. The day is free of planned activities, however there is time to explore independently or take an optional excursion to Chobe National Park. The excursion sets off on an unforgettable safari through Chobe National Park, the second-largest national park in Botswana and encompasses four distinct ecosystems. See its renowned African elephants that can number from 500 to 5,000 depending on the season. Chobe is also home to one of the most diverse concentrations of game and birds found on the African continent. A Farewell dinner is planned for this evening at the hotel. An early breakfast is served at the hotel. Later, transfer by motor coach to the Victoria Falls Airport. There, board your flight to Johannesburg and connect to the flight to Frankfurt. Day 15: Connect to Flight to U.S. Arrive Frankfurt, and connect to trans-Atlantic flights to the U.S. Meals as indicated in the itinerary, including special welcome and farewell dinners .